The UK's first four-seater electric car which can travel up to 70 miles without recharging has been unveiled. 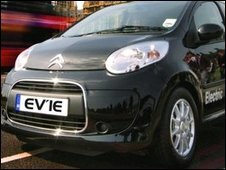 The 60mph vehicle, called the Citroen C1 ev'ie, will cost £16,850. The main body of the car, based on the Citroen C1, is being made in the Czech Republic in a joint venture by Toyota, Citroen and Peugeot. The Electric Car Corporation near Bedford aims to assemble 500 of them this year and hopes to make between 2,000 and 4,000 in 2010. The Citroen C1 ev'ie can be fully charged in six to seven hours from a domestic 13 amp socket for about 90p, according to the makers, the Electric Car Corporation (ECC). ECC chief executive David Martell said: "We believe this is the first serious alternative to a petrol or diesel car. "It drives just like a petrol car and has excellent capacity for use in any town or city in the UK." The cars are being assembled by a six-person team at Flitwick in Bedfordshire. The government recently unveiled plans in the budget to boost the industry, with subsidies of up to £5,000 on electric or plug-in hybrid vehicles but it is thought that eligible cars will not be on the market until 2011. Mr Martell said: "Obviously we are disappointed that it's not sooner." The electric car market is currently reasonably limited, with models available at anything from £8,000 to more than £80,000 for some of the more high-performance models. Sales have failed to take off in the past because of a number of reasons, like the length of time it takes to charge an electric car, the fact that only two-seaters have been available and that top speeds are considerably lower than their petrol and diesel counterparts. Cars - an electric future..?